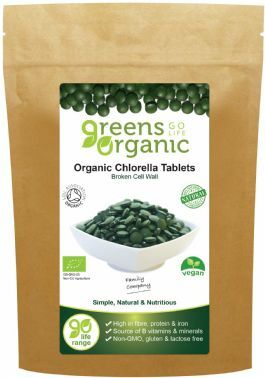 Organic Chlorella is an ancient blue - green algae cultivated in special fresh water pools in an organic environment. It is ground in to a fine powder which cracks the chlorella cell walls for maximum nutrition. Organic chlorella is rich in many vitamins and minerals including Iron which contributes to the normal function of the immune system and the reduction of tiredness and fatigue.